SAP sets an unbreakable record by evolved over time with SAP’s product innovation. SAP proved itself as a owner of Solutions that combined processes to improve and provide an advanced in human lives and revolutionize ways of managing business. So, find below the revolutionized story of SAP ERP Solution and get to know that how it got started and achieving the unpredictable records with the span of time. SAP R/1 System RF 1972 Financial Accounting system. Runs on IBM Servers and the DOS operating system. Mainframe based real time data processing across accounting, manufacturing processes, supply chain logistics and human resources. Three tire architecture ERP Solutions, enabling SAP to be used by enterprises. SAP started focusing on Mid-Sized enterprises and developed this product on the same code base of SAP R/3 on SAP Netweaver platform. It is designed to help businesses optimize their performance and reduce IT costs. It compresses SRM, CRM, SCM, PLM and ERP on one platform. SAP ERP (Enterprise Resource Planning) was the new version of the software, which came with new architecture and was released in 2003-2004, therefore renamed as SAP ERP. The version name for SAP ERP is ECC. Besides this there are other SAP Implementations which can be customized products and can function on the central component. 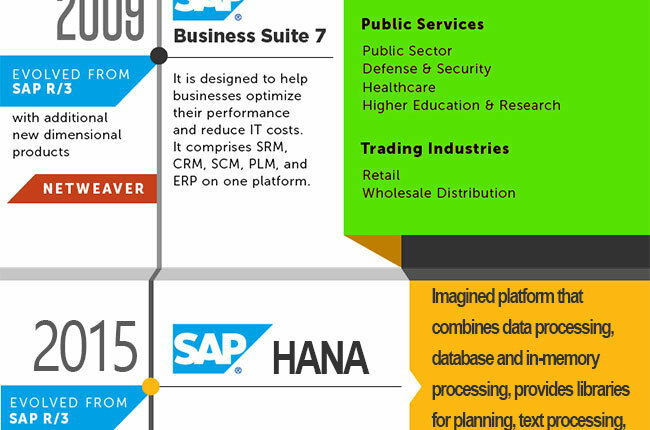 SAP turned out quite dominating for the large business applications market over the next 10 years. SAP ECC 5.0 ERP was the successor of SAP R/3 4.70. The newest version of the suite was SAP ERP 6.0, Enhancement Pack 7. SAP Enhancement Package 1for SAP ERP 6.0: This one released at 21st December 2006 and known as ERP 6.0 EPH1. SAP enhancement package 2 for SAP ERP 6.0: SAP enhancement package 2 for SAP ERP 6.0 is an SAP technique to deliver more innovation, more quickly, in a more accessible way to organizations that have implemented or upgraded to SAP ERP 6.0. The SAP enhancement package 2 for SAP ERP 6.0 enables rapid deployment of select new functionality in a way that minimizes disruption on core production systems. SAP Enhancement Package 3 for SAP ERP 6.0: this one complemented the SAP ERP 6.0 release in a number of focus areas. Far easier to be installed and immediately added incremental value to your business processes without disruption. SAP Enhancement Package 4 for SAP ERP 6.0: this added more value to SAP ERP 6.0 in a number of focus areas. Incase you plan to install enhancement package 4 for SAP ERP, this would give you an overview about the most important documents and notes. This one provided for a better readability. SAP Enhancement Package 5 for SAP ERP 6.0: this one was easy to install and immediately added incremental value to your business processes without any disruption. SAP EHP 6 for SAP ERP 6.0: version for SAP HANA- this was the first version of SAP Business Suite on HANA. SAP EHP 7 for SAP ERP 6.0: Release Information- This enables the maximum areas of the existing SAP ERP functions for SAP HANA to be able to utilize the in-memory technology and also enable better performing business applications. Full form of SAP and What does SAP Stands for?